The newest Suzuki Outboard features innovative contra-rotating propellers and more exclusive features. 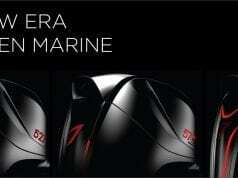 Suzuki Marine, a leader in four-stroke outboard technology and performance, introduces its newest model, the DF350A. 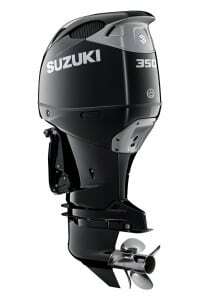 At 350 horsepower, this V6 fourstroke is the largest, most powerful outboard Suzuki has built to date. In development for more than three years, it represents a significant milestone in both engineering and design. 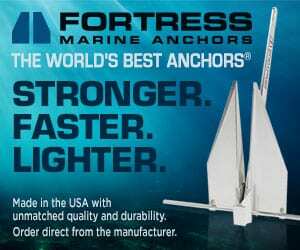 “We have put a lot of work into this new outboard, and we cannot wait to see how the market responds. 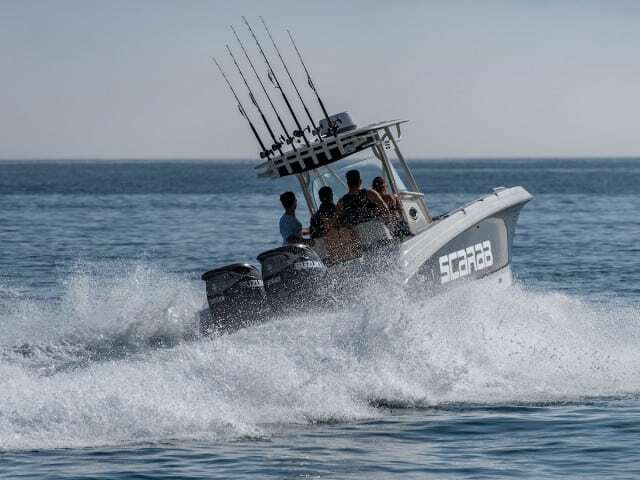 We have watched with great interest as boats have gotten bigger, especially the center console market,” said Yasuharu Osawa, executive general manager of Global Marine & Power Products Operation for Suzuki Motor Corporation. The air intake system allows the engine to draw in ample fresh air while separating out water, spray and moisture. Dual louvers under the hood trap larger water droplets and then moisture as it enters the engine cowling, resulting in zero water intake during testing. In addition, intake air temperatures are, on average, 10 degrees cooler than ambient, providing the combustion chamber with colder, denser air for a more powerful cycle. Two smaller fuel injectors enable precise injection of fuel to the center of the combustion chamber, which avoids off-center combustion—a major cause of knocking. Plus, because 100 percent of the fuel is injected into the cylinder at once, a degree of cooling is also obtained, giving up to 3 percent more power. To achieve 350 horsepower, the surface of the piston needs to withstand added forces. To assure both performance and long life, Suzuki outboard engineers switched from a standard heat treatment to “shot peening,” a more expensive process that creates fine dimples in the face of the piston that evenly distributes the pressure created during combustion. By distributing the power of the engine over six blades instead of just three, the size of the gears and gearcase could be kept to a minimum, which, in turn, allowed for the design of a sleeker, more hydrodynamic gearcase. Suzuki outboard engineers spent many hours in computer simulation and on the water, knowing that reducing drag underwater would be essential to improving overall boat speed and performance. Contra-rotating propellers also provide added surface area for more stability and increased “traction” or grip underwater. (Think of the wide slicks on a drag racer as compared to typical tires.) This results in exceptional acceleration, or hole-shot, truer directional propulsion (eliminating steering torque), better-than-expected top speeds and incredible reverse thrust. More important, these benefits are apparent even on heavier boats with full loads of fuel, gear and people. The DF350A features Suzuki Outboard Precision Control, drive-bywire throttle and shift controls. Skippers will appreciate smooth shifting and precision control of the throttle, not to mention easier rigging, especially when second stations are involved. The DF350A takes advantage of Suzuki’s Lean Burn Control Technology for improved fuel economy throughout the entire rpm range, and especially at cruising speed. Like all Suzuki four-stroke outboards, the DF350A is extraordinarily quiet at idle. 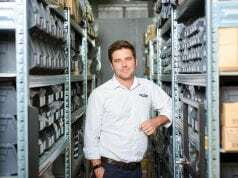 The development of this new outboard has been driven by Suzuki’s belief that it is important to provide the market with more than just horsepower. 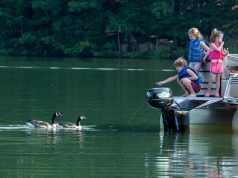 While power and speed are critical factors, the added dimensions of efficiency, reliability and stability make the DF350A the ultimate four-stroke outboard. The DF350A will be available in the U.S. in July. 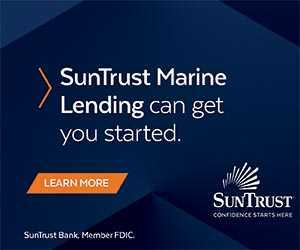 For more information, visit suzukimarine.com.